(No. 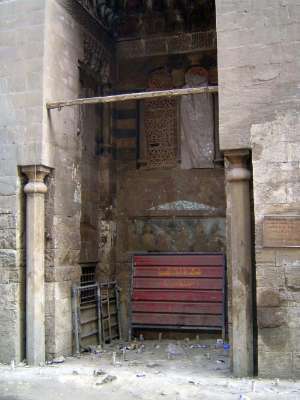 130) The main street continues south past this entrance of the Mosque of Ulmas, built 1329-30. Ulmas was an amir of Sultan al-Nasir Muhammed and became viceroy, only to be executed in 1333. The building is inaccessible and apparently flooded. You can try moving the heavy gate, but if you do a watchman will be roused.